BNP and NT-proBNP: established diagnostic and prognostic biomarkers of heart failure. - Advanced ImmunoChemical Inc.Advanced ImmunoChemical Inc.
Home » Article » BNP and NT-proBNP: established diagnostic and prognostic biomarkers of heart failure. Heart failure is a severe health problem that is characterized by an increasing prevalence and economic cost. According to the American Heart Association, in the United States nearly one million new cases are reported each year. 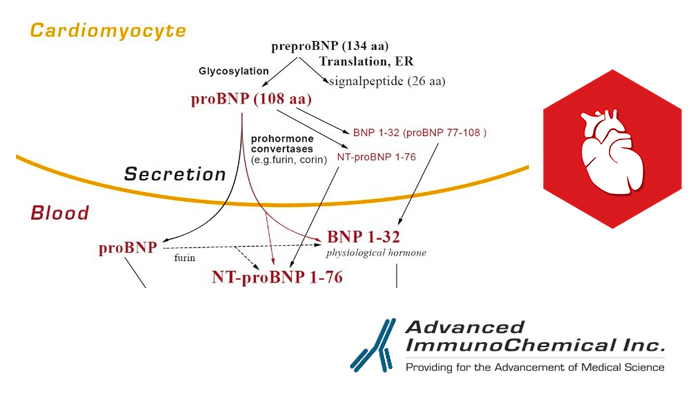 BNP and NT-proBNP are established diagnostic and prognostic biomarkers of heart failure. The clinical values of these markers are similar and both of them are used in clinical practice. Clinical guidelines recommend measuring either BNP or NT-proBNP in order to rule out heart failure in the initial assessment of a patient with suspected acute heart failure. Both markers can also be used to monitor the progression of the disease. At Advanced ImmunoChemical, Inc., we provide a broad range of well-characterized monoclonal antibodies that allow for the development of sensitive and reliable immunoassays for the detection of proBNP, NT-proBNP and BNP in clinical samples. We also provide different recombinant antigens that can be used as standards and calibrators in immunoassays (see below). For more information about the products and development of prototype immunoassays for BNP (conventional and SES-BNP™ assays) and NT-proBNP as well as of immunoassays detecting only full-length proBNP, please see our Human proBNP, BNP and NT-proBNP. Open AssayNotes. Kindly visit us at AdvImmuno.com to see our other clinical diagnostic areas of interest.